Demand for semiconductors and passive components showed signs of weakening in February—a trend that is expected to last through the first half of the year. “Based on our findings, we believe the industry has yet to see a bottom as demand and bookings continue to weaken, as well as inventories continuing to rise,” said Technology Partners Consulting. It’s an abrupt reversal from two years of widespread component shortages and allocated inventory. Of 18,000 industry experts surveyed by TPC, 72 percent expect weaker demand in Q1 versus the end of last year. For the second quarter of 2019, 35 percent expect slower growth from Q1. About one-third of respondents see Q2 as “subseasonal,” which is significantly weaker than the previous two years. TPC said all its metrics point to a softer market and other data is a mixed bag. The industry’s two largest electronics distributors closed calendar 2018 with record sales but noted book-to-bill ratios declined in the fourth quarter of the year. The Institute for Supply Management reported new manufacturing orders in February had slowed from the prior month; and the Semiconductor Industry Association announced global chip sales in January declined. Distributors, which carry hundreds of component suppliers, have considerable visibility into industry demand. So far, executives aren’t worried. 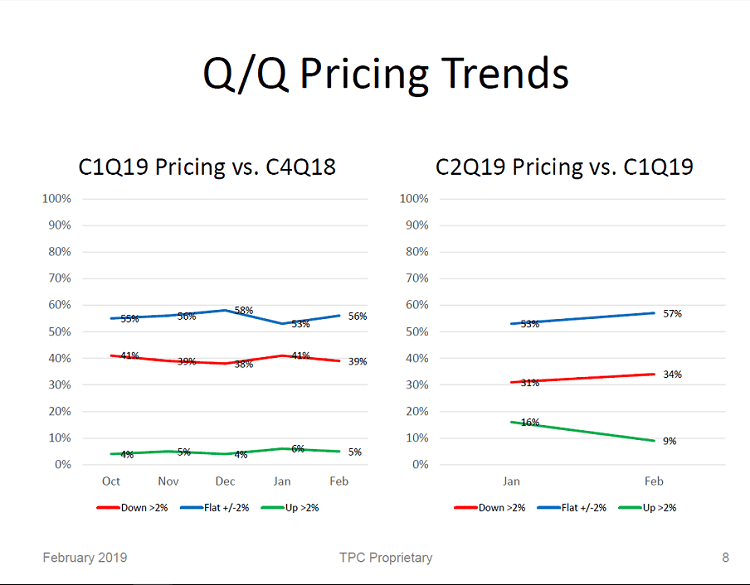 Booking expectations for Q1 declined for 21 percent of TPC respondents. The outlook for Q2 doesn’t improve—26 percent of industry participants expect lower bookings. 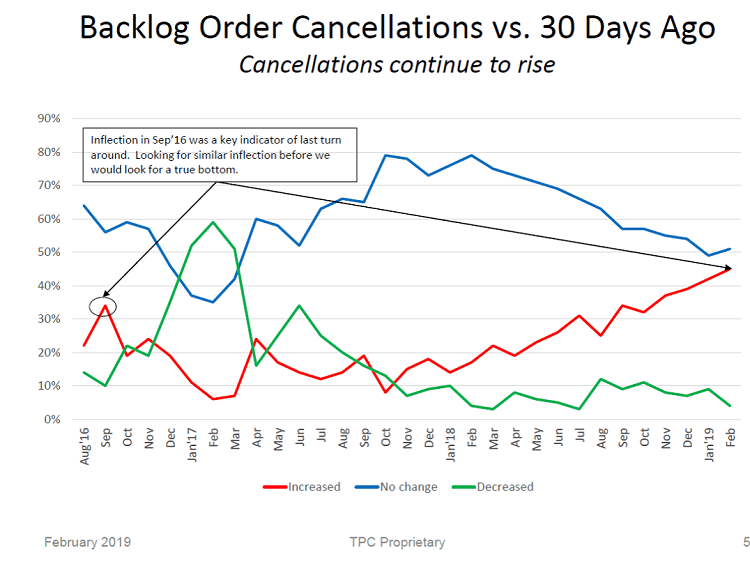 Order cancellations may be contributing to increased inventory levels, which 41 percent of TPC respondents experienced in Q1 2019. Availability is continuing to improve in all markets, the research firm said, with most previously allocated products now above normal inventory levels. Component prices are expected to decrease in Q2, according to 34 percent of TPC respondents. More than half of respondents–57 percent–expect pricing to generally be flat while only 9 percent expect it to increase. Lower pricetags will depend on the component, however. The recent shortage enabled many suppliers to hike prices and phase out older technologies. Latest-generation devices will likely hold their value. For semiconductors, the long-term outlook remains promising, according to the SIA, due to the ever-increasing semiconductor content in a range of consumer products, artificial intelligence, virtual reality, the Internet of Things, and 5G. TPC provides ECIA with a monthly report on a market trends survey administered by Glenn Hitchcock, TPC founder and president. The report provides results from a survey sent to 20,000 electronic industry professionals across the globe to assess their expectations for order activity and inventory levels.